What are Refined Functional Carbohydrates (RFC™) and How Do They Promote Gut Health? Author/s : Dr. Sangita Jalukar / Arm & Hammer Animal Nutrition, Princeton, NJ, USA. Imminent VFD regulations are anticipated to create challenging conditions for dairy producers. Yeast products are one of the many options that are being explored to overcome these challenges. There is a wide range of yeasts and yeast-derived products available but with varying efficacy. Refined Functional Carbohydrates (RFC™) derived from yeast act through a number of mechanisms to alleviate production stressors leading to improved profitability. Some of these benefits include ability to manage cryptosporidiosis and coccidiosis, bacterial morbidity and mortality, and decrease mycotoxin damage. However, mechanisms by which these carbohydrates work in the host are not well understood. Furthermore, the manufacturing process involved in refining these functional carbohydrates from yeast seems to play a role in functionality of the resulting products. There seems to be a great deal of variability in the size and structure of these carbohydrates when compared between yeast products. Interestingly, functionality of a product does not seem to be directly related to the quantity of these carbohydrates present in the product. Preliminary structural and functional comparisons done between yeast products manufactured with different processes indicate some similarity and some dissimilarity. While the structural components of yeast cells, mainly the MOS, beta glucans, and chitins are present in similar concentrations, there are differences in their molecular weights, their linkages and in functionality. RFC in CELMANAX™ (Arm & Hammer Animal Nutrition) are components harvested from yeast cells (S. cerevisiae) using specific enzymes during the manufacturing process. Some of these functional carbohydrates have been identified to be mannose, oligomers of mannose (MOS), or polymers of mannose called mannans and beta 1,3-1,6 glucan residues. Since mode of action studies in vivo are complex and difficult to interpret, we have performed in vitro studies followed by in vivo studies to understand the mechanisms of RFC. The gut plays a critical role in livestock production. It is both the site where nutrients are converted to energy for growth and the site where energy is utilized for maintenance. The balance between the two determines growth, efficiency, and profitability for livestock production. Key to achieving this success is balancing the gut microflora. RFC support the commensal microflora to improve feed digestibility (Dann et al., 2014) while preventing the pathogens and mycotoxins from causing acute (Baines et al., 2011a) and sub-acute damage (Baines, 2014). Host-pathogen interaction or disease process for a number of pathogens (both bacterial as well as protozoan) is mediated via carbohydrate-lectin (receptor) interaction (King et al., 2000; Stein et al., 2006). The carbohydrate and its ligand are expressed on the surface of the pathogen and on the gut epithelial cells. This recognition facilitates pathogen attachment, colonization, and infiltration. One well studied example of such interaction is seen in gram-negative bacteria with mannose dependent class one pili (King et al., 2000). Mannose, its oligomers and its polymers are RFC present in CELMANAX. RFC has shown ability to decrease attachment and infiltration of various enterotoxigenic E. coli (ETEC) and Shiga-toxin producing E. coli (STEC) (Figure 1) as well as serovars of Salmonella enterica in bovine colonic cell lines in vitro in a dose-dependent manner (Baines and Lowe, 2014). Supplementation of RFC in receiving calf diets for 35 days decreased proportion of calves shedding O157, non-O157 and non-Shiga-toxin producing E. coli compared to unsupplemented calves (Baines and Erb, 2013). Similar carbohydrate-lectin interaction has also been reported for Cryptosporidium and Eimeria (Stein et al., 2006). In vitro studies with RFC show a dose-dependent decrease in attachment and infectivity of Cryptosporidium parvum sporozoites in bovine (MDBK) (Figure 2) and porcine (IPEC) epithelial cell lines (Jalukar and Nocek, 2009). In research studies, calves receiving RFC were 50% less likely to get infected with C. parvum compared to unsupplemented calves (Santos, 2008). Moreover, infected calves receiving RFC stopped shedding faster and had less scouring and dehydration compared to unsupplemented calves (Figure 3; Jalukar and Nocek, 2009). Although not tested in ruminants, RFC-supplemented poultry diets led to reduced coccidial lesions in broilers (Jalukar et al., 2008). A 2015 Biomin® mycotoxin survey analyzed 1,586 samples from the Americas and reported that 72% of all samples tested in North America contained at least one mycotoxin and 25% contained more than one mycotoxin. Presence of mycotoxins in feed leads to gut damage, immune suppression, and secondary infections, and sometimes feed refusal resulting in morbidity and mortality losses. Beta 1,3-1,6 glucan, a type of RFC present in CELMANAX, has been reported to bind mycotoxins and reduce mycotoxic damage. 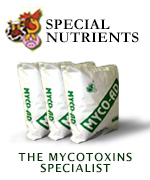 In in vitro binder studies, RFC bound a variety of mycotoxins. RFC also decreased cytotoxic effects of mycotoxins at the gut level in vitro (Table 1; Baines, 2014). To test in vivo RFC application on aflatoxin transfer, dairy cattle receiving naturally contaminated feed received unsupplemented or RFC-supplemented diets. RFC supplementation blocked 100% transfer of aflatoxin B1 from the feed and digesta into milk in 3 to 7 days (Baines, 2014). Hemorrhagic bowel syndrome (HBS) caused by a combination of moldy feed and opportunistic pathogens is a sporadic but acute disorder resulting in high mortality. Since RFC have been shown to be effective at reducing mycotoxin damage as well as prevent pathogens from colonizing, it was no surprise when dairy and beef cattle farms experiencing HBS saw a reduction in HBS-related deaths (Baines et al., 2011a,b) with RFC supplementation. Both mannan and beta glucans (types of RFC present in CELMANAX) are known to interact with neutrophils and macrophages of the immune system in various species. However immune stimulation uses a lot of energy. Therefore it is very important that the immune stimulation occurs only when there is a challenge. At the normal recommended dose, in absence of a challenge, RFC do not stimulate the immune system and do not negatively impact feed efficiency (Dann et al., 2014). However, during a challenge with ovalbumin, RFC-supplemented animals reported a higher anti-OVA Ig (Yuan et al., 2015). RFC-supplemented dairy cows reported higher lymphocytes and granulocytes, and lower IL-8 in the first few weeks post calving, which coincided with lower incidence of both clinical and subclinical mastitis (Proudfoot et al., 2009). Similarly, RFC supplementation in the transition phase resulted in significantly higher platelet count and a tendency for higher bactericidal activity by whole blood while significantly lowering uterine IL-6 inflammatory response (Yuan et al., 2015). However, it is unclear at this time whether these immune responses are the cause or effect of improved health status of cows. In summary, the synergistic effects of the various RFC have the potential to reduce multiple production stressors leading to improved profitability—responsibly. Presented at the 2016 Penn State Dairy Cattle Nutrition Workshop.